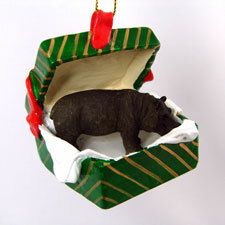 A richly detailed hippopotamus figurine is nestled inside this green gift box with a loop for hanging on your holiday tree, in front of a window, or wherever you like. The hippo is hand painted on stone resin and boxed. Buy one today for the hippo collector in your life!